I’ve been working on a project about translation, for a celebratory exhibition that LCC has staged to honour the 50th anniversary of the release of 2001: A Space Odyssey. In the collection of Kubrick materials held at the Special Collections and Archives is a box of sound recordings of chimpanzees. The recordings were made as research for the Dawn of Man sequence that starts the film. That’s the information. Play these tapes and something much more mysterious and interesting than simple information unfolds. 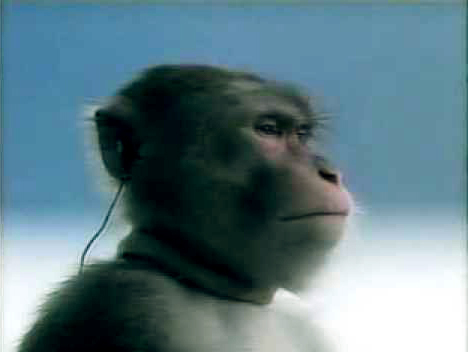 There are about thirty hours of chimp recordings in total. I don’t know if Kubrick ever listened to them or not. I listened to five hours of them and even though the sounds felt to me like a wall of meaning I could never really access, I began to recognise patterns, repeated sounds, variety in tone. For the exhibition I challenged a group of carefully selected people to translate a short sample of the sounds as a kind of translation experiment* and invited anyone who visited the exhibition to join in with the experiment and translate the same sample themselves. How do we make meaning when we come across something for which we have so little real point of reference? In the (supposed) age of information this is quite a challenge. It made me think about Kubrick’s approach to filmmaking. Despite what an audience sees on screen – the perfectionism, the control of his image-making –I’m convinced after my time in the archive that Kubrick’s guiding directorial energy was less derived from intellect, more from instinct. In Elaine Dundy’s Dr Strangelove interview with Kubrick, he suggests that as a director he should never question his instinct too much. He says making a film is like falling in love. You just go with the fall. You don’t analyse the feeling, or the person, or the why. The instinct is pure and you have to trust the galvanising force of that to make the film work. I quoted the Milosz poem Love at the start of this blog. In Kubrick’s copy of Milosz’s poems he underlines the final line, highlighting at a much later stage of his career, this same sentiment – ‘who serves best doesn’t always understand’. How audacious – I can’t get over it really. If Hitchcock reveals dream structure in film I see now that Kubrick unleashes the motivation for dreams, the unconscious. It’s as if by creating a perfect orderly laboratory, one crammed with state of the art technology, experts and technicians, people working optimistically on the component parts of an organic whole to which they are never totally party, something other, non-literal, untranslatable, can be freed. Maybe this is why Kubrick’s films are quite so unsettling to watch. It is not only the representation of things in life, like violence and death, that we tend to disavow, but the revelation of the force of the motivation behind the visible action. It’s like pulling up the carpet in an ordinary room and seeing only the blackness of outer space under our feet: the revelation that the human world spins round fuelled simply by the force of unnameable untranslatable libidinal drives. In the end, chimps probably understand the process of creation far better than people. * the translations are published as The Enigmatic Message. It's available here.